Lagos, Nigeria. Three strangers meet three yards from the sea on the city’s Bar Beach late on a January evening: Adaora, a marine biologist who lives in the affluent part of town; Agu, a soldier whose moral compass has earned him a beating from his colleagues and set him on this path tonight; and Anthony, a famous Ghanian rapper, who has just finished performing. The three are here to bear witness to arrival of extraterrestrials, and to become the first people to make contact with the strange woman – Ayodele – who walks from the sea shortly after they meet on the beach. As word of the invasion leaks, various factions attempt to gain control of Ayodele for their own means and civil unrest erupts. The aliens claim to come in peace, but the only man who can broker a deal that will save the country from falling into brutal civil war is Nigeria’s president, a sick old man who isn’t even in the country. 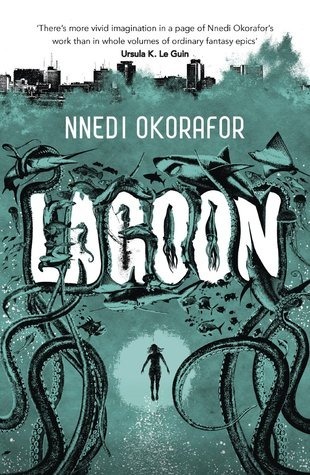 Nnedi Okorafor’s latest novel, Lagoon, takes a fresh look at the alien invasion story, ignoring the most frequently-visited locations for this kind of novel (New York, Los Angeles, London), opting instead for Nigeria’s largest city, something of an unknown quantity for many British and American readers (myself included). We learn in the opening chapter what sort of impact this invasion – as peaceful as it claims to be – is likely to have on the city, country and wider planet. The aliens take the form of the indigenous species, and have the ability to enhance those species physically and mentally. As they land in the Lagos Lagoon itself, their first encounter is with the sea life, and it takes no time before these enhanced creatures are fighting back against the human invasion of their territory – puncturing oil lines, attacking boats. It should come as no surprise, then, that the three human characters at the centre of the story should be enhanced beyond normal humans either. Each has a gift, something that sets them apart, and something that caused them to be drawn to the shore at Bar Beach at exactly the right moment. Whether these enhancements are due to the influence of the visitors or not is a question left open for the reader to decide: we are given no clear indication of when these aliens arrived, or how long they may have lain dormant off the shore of Nigeria before they made their presence known. The heart of the story, though, despite the colourful characters that Okorafor presents to us, is the city of Lagos itself. It is painted as something of a melting pot, a mix of cultures and languages (there are at least three different ones referenced throughout the book), a city like no other on the face of the planet. Such is Okorafor’s descriptive power that we find ourselves in the middle of this unique city, smelling the food, hearing the sounds, sucked into the thick of the story. It’s a city that cries out to be visited, despite its darker side. Like any city, Lagos does have a dark side. Okorafor introduces us to a number of groups whose aim is to get hold of the alien ambassador for their own purposes, whether it’s financial gain (in the case of Moziz and his friends), or a perceived path to spiritual salvation (as Father Oke would have his congregation believe) or for more sinister reasons (like those that drive the army). For the most part, these are groups that could only exist in this strange city: 419ers and missionaries, people whose sense of entitlement overrides all consideration of consequences for their fellow men. As such, Lagoon and the city of Lagos are tightly intertwined and, unlike the more generic "Western" tales of this ilk, the story is not transferrable outside the city limits. It’s a beautifully-told story that does, however, have a tendency to slow down quite a bit, especially earlier in the narrative. On reflection, it’s easy to pinpoint what causes these lulls, and it’s a fault that lies entirely with this reader (and will, I suspect, affect others in a similar way). Several sections of the book – specifically, but not limited to, the sections that feature Moziz – make heavy use of Pidgin English in the dialogue. When we first encounter this language, it’s difficult to understand, and requires some extra work to try and decipher what’s being said, and whether it’s important enough to the overall plot that the gist will be enough. As we get more exposure, though, and find the rhythm of these peoples’ voices, it becomes easier to parse and affects the reading experience much less. It’s worth noting that there is a glossary at the back of the book and, if you’re having difficulty with the language early on, it’s a helpful guide to what is being said. That aside, Lagoon is a wonderful, exotic take on a familiar science fiction trope. I’m ashamed to admit that, not only is it my first exposure to 2011 World Fantasy Award winner Nnedi Okorafor, but it’s also the first time I’ve encountered her work at all. The combination of setting and vivid characterisations serve to set this apart from anything else you’re likely to have read in a long time. Okorafor introduces some interesting tricks to give us some outside perspective, a quick look at the situation through the eyes of characters who otherwise have nothing to do with the progression of the plot. There is a section in the middle of the book where a number of people take turns declaring "I was there" and telling their story, a riff on the theory that everyone remembers where they were and what they were doing when Neil Armstrong first set foot on the moon, or when John F. Kennedy took his final, fatal drive through Dallas’ Dealey Plaza. Nnedi Okorafor brings a unique voice and fresh and interesting perspective to science fiction. Lagoon is a novel in which it is almost impossible not to completely immerse yourself for the duration. Using the exotic location to its fullest extent (Okorafor evokes Lagos in her writing in much the same way that James Lee Burke evokes that other unique melting pot, New Orleans), the author spins a tale that captures the reader on the first page and keeps them interested until the last page. You won’t have read anything quite like this, and I can say with some confidence that you won’t be disappointed.